Once a thriving community with businesses, churches, a post office and school, there is not much left of the town known as Pandale, TX. 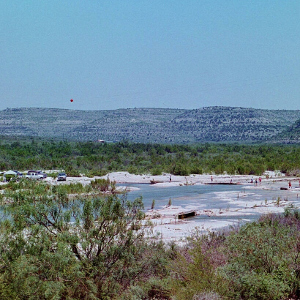 Located approximately 48 miles southwest of Ozona, most people only visit now to enjoy the Pandale River Crossing on the Pecos River. The drive from Ozona is beautiful and remote, but be aware that the last 13 miles are by unpaved road because the pavement ends at the Crockett County line. Please take this section slowly. At the crossing, you will find the shallow waters lined by large slabs of flat rock, which provide a wonderful place to relax, swim and picnic. This is also a popular launch point for hardy souls who want to canoe or raft down the Pecos River toward its confluence with the Rio Grande, a trip that is not for the faint of heart! Turn south (left) on FR 2083 for approximately 31 miles. This section is paved. Continue south on FR 2083 for approximately 13 miles. This section is unpaved. 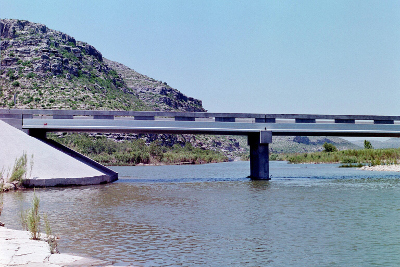 When you arrived at the paved bridge across the Pecos River, you have reached Pandale River Crossing. There are no fuel stations or convenience stores along this route, so make sure you have a full tank of gas, some fresh drinking water and snacks. Be aware of the weather conditions. This area is prone to flash flooding. If you find yourself in a flash flood, do not drive into water. Your vehicle may stall in as little as 6 inches of water and can easily be washed downstream in the swift current. Don't Drown, Turn Around! Head for higher ground. If caught between flooded crossings, remember that flash floods pass quickly. Be patient, the waters will recede soon, usually within an hour or two. This is a remote and primitive area, with no lifeguards, and is unsupervised. You swim and picnic at your own risk. Watch out for snakes, insects and other critters that might spoil your fun. Temperatures can be high in the summertime, so take plenty of fresh drinking water and use your sunscreen. The nearest emergency services are 50 miles away. There is no reliable cell phone service. Most travelers prefer to return to Ozona because the roads south of Pandale continue to be unpaved for 30 to 50 miles, depending on the route, and can sometimes be rough. 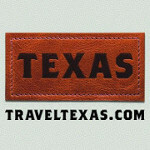 For more adventure, try our Law West of the Pecos Loop Itinerary.